In his recent speech calling for legislation to stop corporate inversions, President Obama added fuel to the misperception that when a company moves its headquarters to another country it avoids paying U.S. taxes. 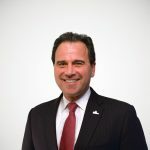 He said, "If you are doing business here, if you are basically an American company but you are simply changing your mailing address in order to avoid paying taxes then you are really not doing right by the country and the American people." But Obama is not alone. In a July 24 article on corporate inversions, The Wall Street Journal’s John D. McKinnon and Siobhan Hughes wrote “When a company inverts, it can reduce or avoid U.S. corporate taxes.” This is a clear overstatement and likely misleading to the casual reader. As I wrote here recently, moving its headquarters to another country does not relieve a company of paying U.S. income taxes unless it ceases to have income in this country. The domestic operations of inverted companies—like the U.S. subsidiaries of all foreign based companies—will continue to pay U.S. income taxes on the profits they earn in this country. What the move abroad does accomplish is relieve the firm from paying U.S. income taxes on its foreign earnings, which it currently has to do under our obsolete worldwide tax system. One of the big concerns about inversions is that this trend will erode the U.S. tax base. But, as I wrote in a previous blog, this is a mistaken concern because the U.S. subsidiaries of foreign companies actually pay a higher average effective tax rate than do all corporations as a whole. According to IRS data, in 2011, foreign-owned companies paid an effective tax rate of 27 percent compared to 22 percent for all corporations. 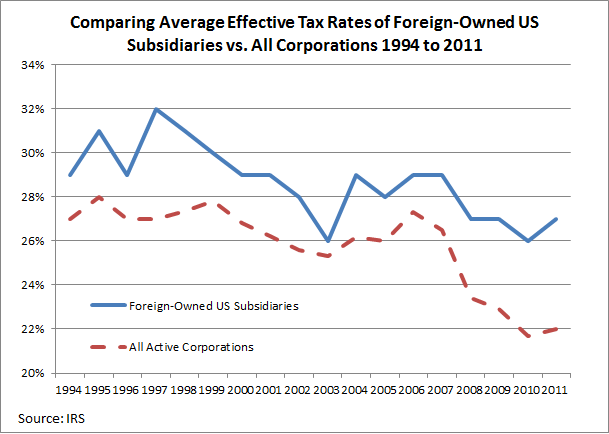 Below is a chart comparing the effective tax rates for foreign-owned firms with the effective tax rates for all corporations from 1994 to 2011. As you can see, foreign-owned firms have consistently paid a higher effective tax rate than the average for all corporations. Over the 18 year period, the effective tax rate for foreign-owned firms has averaged 29 percent, compared to an average of 26 percent for all corporations. This data would indicate that fears of inversions leading to “earnings stripping” are overblown. Indeed, the administration has hinted that it could unilaterally change some IRS rules to limit the ability of foreign firms to load up debt on their US subsidiary and pay interest back to the parent. During the last round of inversions in 2004, there was similar talk of tightening what are known as 163(j) thin-cap rules to prevent earnings stripping. Cooler heads prevailed when people realized that if we tightened our thin cap rules, other countries would retaliate against our companies in a similar fashion. The administration may want to think twice about taking unilateral action without considering the consequences.